Much has been made of the health benefits of sauna bathing. Physically, nothing is more reinvigorating than a deep, healthy sweat every day. Tension fades, muscles unwind, mentally, we emerge relaxed, revived and ready for whatever the day may bring. Sauna bathers most frequently cite stress reduction as the number one benefit of sauna use. Medical studies often determine that stress in our daily lives can negatively affect our health. In fact, the vast majority of disease (i.e. heart disease) is at least partially stress-related. Heat bathing in a sauna provides stress relief in a number of ways. It’s a warm, quiet space without any distractions coming from the outside. 4. Sauna cleanses the skin. Heat bathing is one of the oldest beauty and/or health strategies in terms of cleansing one’s skin. When the body begins to produce sweat via deep sweating, the skin is then cleansed and dead skin cells are replaced – keeping your skin in good working condition. Sweating rinses bacteria out of the epidermal layer and sweat ducts. Cleansing of the pores has been shown to improve the capillary circulation, while giving the skin a softer-looking quality. By continually flushing body waste through individual cells, one eventually brings back vitality, tone and a healthy glow to the skin. Sauna usage is certainly not a cure for acne, but it can very often help – due to the deep cleansing it provides from a deep sweat (that is, cleaning the pores from the very inside out – instead of just cleaning the top of the skin). Research has shown that a deeper, more relaxed sleep can result from sauna use. In addition to the release of endorphins (see above), body temperature is raised in the late evening only to fall once bedtime comes around. This slow, relaxing decline in endorphins is key in facilitating sleep. Numerous sauna bathers worldwide recall the deep sleep experiences that they feel after bathing the calming heat of a sauna. In the high temperatures of a traditional or infrared sauna, skin heats up and core body temperature rises. In response to these increase heat levels, the blood vessels near the skin dilate and “cardiac output” increases. Medical research has told us that the heart rate can rise from 60-70 bpm (beats per minute) to 110-120 bpm in the sauna (140-150 with more intensive bathing), and can often sink to below normal after the cooling off stage. 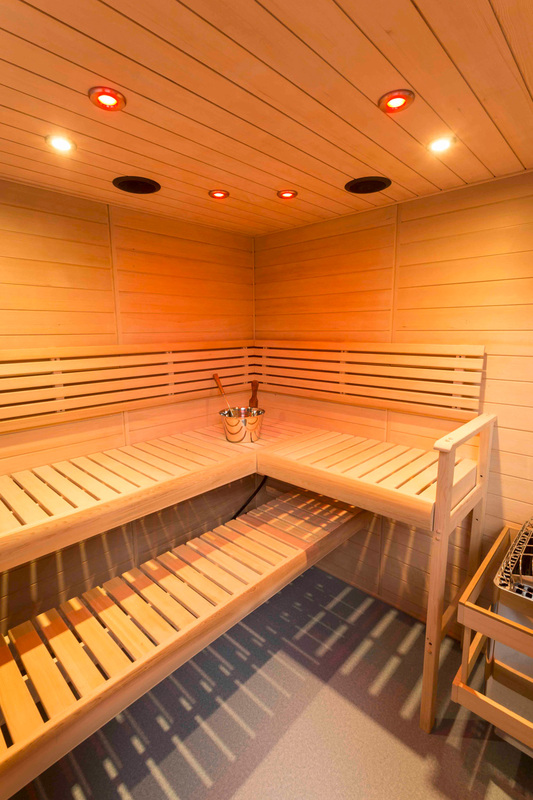 With regular sauna useage, we not only train our heart muscles and improve the heart rate/cardiac output, but we also help the body’s regulatory system. Even more cardiovascular conditioning takes place when the sauna bathing is taken in multiple “innings”, with sessions in the sauna separated by a cool shower or a quick dip into a cool pool or lake. Each time you rapidly change temperature (from hot to cool or vice-versa), your heart rate increases by as much as 60%, which is very comparable to the increase experienced during moderate exercise. The sweating process itself requires a notable amount of energy. That energy is derived from the conversion of fat and carbohydrates in a bodily process that burns up calories. According to U.S. Army medical research (Ward Dean, M.D. ), “A moderately conditioned person can easily sweat off 500 grams in a sauna in a single session, consuming nearly 300 calories in the process.”The body consumes said calories due to the acceleration of heart activity (the cardiovascular section). As heart activity increases and as these processes demand more oxygen, the body begins to convert more calories into usable energy. German sauna medical research shows that saunas were able to significantly reduce the incidences of colds and influenza amongst participants. As the body is exposed to the heat of a sauna and steam it produces white blood cells more rapidly, which in turn helps to fight illnesses and helps to kill viruses. In addition, saunas can relieve the uncomfortable symptoms of sinus congestion from from colds or allergies – especially when used with steam (tip: add eucalyptus to the water for added benefit and overall enjoyment). The steam vapor action helps to clear up unwanted congestion and is a wonderful aspect of the Finnish sauna experience. A sauna not only feels good, it’s good for your body. Whether it’s the physiological changes that occur during the warmth of a sauna, or if it’s simply the time spent in the calming and still retreat of the sauna, every seasoned sauna bather agrees – it feels wonderful! As we progress through our stressful everyday lives, the sauna provides a pampering retreat – where we can relax and restore body and soul. Sauna bathing truly makes you “Feel Better”, “Look Better” and “Sleep Better”!.